This short catalogue introduces WIPO's publications on trademarks, geographical indications and industrial designs. We offer a wealth of content including key international treaties, research and policy studies, practical guides for business people and explanatory briefs for the general public. This publication provides an introduction to geographical indications, explaining their basic features, use and protection as an intellectual property right. Written for non-experts, it is a starting point for readers seeking to learn more about the topic. 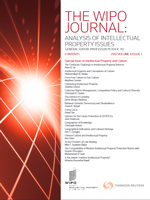 Special Issue on Intellectual Property and Culture. 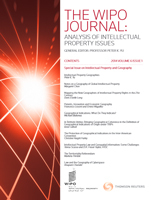 Contents: The Confucian Challenge to Intellectual Property Reforms | Intellectual Property and Conceptions of Culture | From Free Culture to Fair Culture | Cultivating Intellectual Property | Collective Rights Management, Competition Policy and Cultural Diversity | The Demise of Geniality | Between Semiotic Democracy and Disobedience | Going GaGa | Options for the Future Protection of GRTKTCEs | Geographies of Knowledge | Geographical Indications and Cultural Heritage | Chinese Culture and Intellectual Property | At the Frontiers of Law-Making | The Compatibility of Modern Intellectual Property Protection Norms with Islamic Principles | Is the Jewish Tradition Intellectual Property? 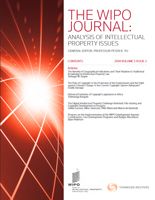 This Study deals with intellectual property, in particular, trademarks and geographical indications, as an instrument not only for developing a strong and distinctive brand image for national products and services but also, through such a process, for creating a strong and distinctive nation brand, in both cases, with a view of gaining a competitive advantage in domestic, regional and world markets.